Ft Myers Air Conditioning – Air conditioning service and repair in Ft Myers Florida. Air conditioning service and repair in Ft Myers Florida. As a Ft Myers air conditioning contractor one of the most common problems I encounter on repair calls is a burned wire. Air conditioners in SW Florida work in fairly extreme conditions. Not only are a/c units sitting outside, exposed to sub-tropical heat and humidity, but also generate significant amounts of heat on their own. This one two punch of internal and external heat sources is hard on all parts of ones HVAC equipment, and especially hard on the housing that insulates the wiring inside your equipment. By the time a wire is visibly damaged it has already been something of a detriment to your air conditioning equipment for some time. Even a microscopic crack in the housing can cause arcing, minimal performance, and unnecessary strain on the various component parts that work independently, and in conjunction with each other, to provide a level of comfort that is satisfactory. Any variance in the voltage has the potential to throw the balance “out of whack”, causing the equipment to work harder to achieve the desired result, which often translates into higher utility bills, and equipment that doesn’t last as long as it should. Another common problem that arises in today’s air conditioners is an extremely simple one … many customers don’t realize their thermostat now runs on batteries instead of being wired directly to the homes electrical panel. We have gotten in the habit of asking our clients that call to check the batteries in their thermostat BEFORE we send a truck out on a service call. 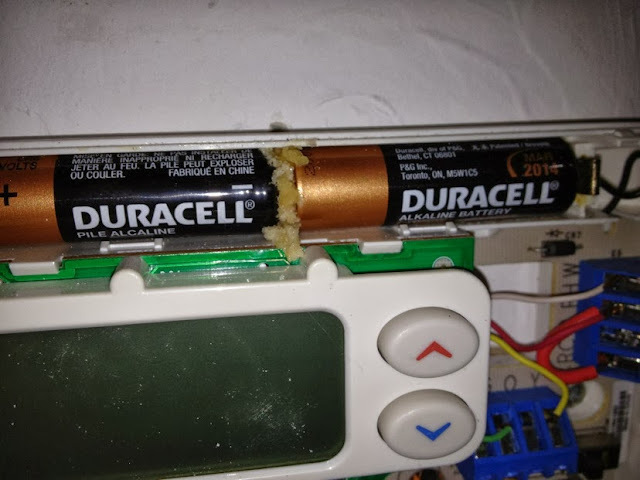 Too many times have we arrived on the scene only to discover all the client needed to fix the problem was two batteries they already had, sitting in their kitchen drawer! Community Cooling and Heating has been serving Lee County Florida since 1970, and our long standing reputation for honesty and integrity is important to us! We believe in putting our clients needs first, earning your trust, and making sure we provide a level of service that ensures you will call us again the next time! Proper maintenance is your best defense against the onslaught of high summer utility bills. Here in southern part of the U.S. the cost of running your air conditioner is a major part of your electric bill. With a little thought and planning it is possible to significantly reduce the workload of your a/c unit thus reducing the amount of electricity you use and extending the life of your air conditioner. Make sure your a/c vents, both incoming and return, are not blocked by furniture or draperies. Turn off any electric light bulbs when not in use. Light bulbs generate heat that must be removed by your a/c unit. Change your a/c filter monthly! Cook on your outside grill when possible or use a microwave oven. Cooking on a stove or conventional oven adds heat to the inside of your home. On cooler days open your windows or rely on ceiling fans to keep your home comfortable. Our well stocked trucks, and well trained air conditioning technicians are always on call when you need air conditioner serve, repairs, or maintenance. HIGHER THAN NORMAL ELECTRIC BILLS? AIR CONDITIONER RUNS LONGER THAN IT SHOULD TO COOL YOUR HOME? INSUFFICIENT COOLING IN YOUR HOME? Not knowing why … IS COSTING YOU MONEY! Air conditioner services Ft Myers can depend on! Community Cooling takes great pride in showing up on time, accurately assessing your air conditioning problem, and providing the consumer with the full range of options available to him … and then letting the customer decide which option makes the most sense to him personally, and fits his family’s budget as well! Air conditioning, or controlling humidity and air temperature, is a concept that has appealed to people throughout the ages. Heating was a fairly simple matter, fire can be contained in a reasonably small space and warmth will radiate from it. Removing heat and moisture from the air, however, proved to be far more challenging! Over the years many cultures and civilizations have experimented with ways to create and improve on methods to keep their dwellings cool and comfortable. During the 2nd century the Chinese used rotary fans and water to cool their dwellings. Roman Emperor Elagabalus in the 3rd century had snow from the mountains carried in by teams of donkeys and piled up outside his home to keep it cool. Wealthy citizens of ancient Rome circulated water from the aqueducts through the walls of their homes to keep it cool. In 1820 an English inventor, Michael Farraday, discovered that liquefied ammonia would chill the air when allowed to evaporate. In 1842 John Gorrie, a physician in Appalachicola, Florida used compressor technology to create ice and cool the air for his patients. In 1851 Australian James Harrison invented an ice machine using vapor compression refrigeration, a predecessor of the technology used in our modern day equipment. His commercial ice making machine could make 6,600 pounds of ice per day! In 1881 U.S. President James Garfield was dying. To keep him comfortable air was blown through cotton sheets doused in ice water. It is said that during his final 2 months over a half million pounds of ice were used for the process. In 1902 Willis H. Carrier invented the 1st electric air conditioner. It was not designed with human comfort in mind, but, to reduce humidity in a printing plant where he was employed. In 1922 Carrier invented the centrifugal chiller which significantly reduced the size of the equipment. The invention was made public in 1925 at the Rivoli Theater in New York on Memorial Day Weekend. Other theaters quickly added air conditioning and movie-going became a great way to beat the summer heat … one of the reasons summer is the traditional time for the biggest movies of the year to be released! In 1928 Thomas Midgely invented Freon. Previous coolants were toxic and extremely flammable posing a serious threat to those who used the equipment. 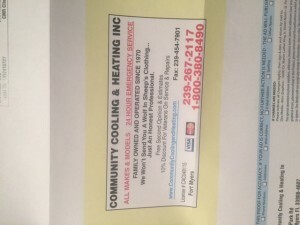 Community Cooling & Heating Inc. Failing capacitors are one of the common reasons for malfunctions in an AC. 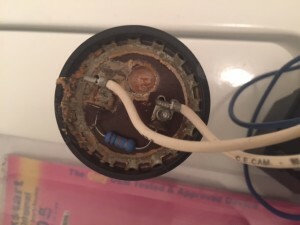 Thankfully, if you catch capacitor trouble in time, repair technicians can easily swap them out for new ones without any serious effect to the AC. However, if bad capacitors are ignored, you may end up with a non-functioning air conditioning system right when you need one the most. One of the most essential components of an air conditioning system are the capacitors. A capacitor is used to store energy in an electrostatic field. Capacitors perform the task of maintaining an even flow of voltage to running motors, and providing a requisite initial jolt to start the motor in the first place. For air conditioning purposes capacitors are connected to three main motors … the compressor motor, the blower motor, and the outdoor fan motor. Each of these has an individual capacitor, or set of capacitors, to start it (the start capacitor), and to keep it running (the run capacitor). The most common problem that bad capacitors can cause is “hard starting.” This is when the compressor of an AC has difficulty starting up, stutters trying to turn on, and then shuts off a short while later. There are a number of different causes for hard starting, but a bad start capacitor is probably the most common, as well as being a relatively simple, and low cost repair. while not always easy to diagnose that a start capacitor is the problem, a trained, knowledgeable technician will quickly pick up on any visible signs such as splitting, bulging, frayed or discolored wiring, or even leaking oil. They will also run electrical tests for amperage and continuity to be certain the capacitor is the source of the trouble. Before a capacitor fails, it often times will begin to make a clicking noise or intermittently, run for only short periods of time, or make a humming noise as the motors begin to turn. This is a good time to have a contractor check it out before the compressor or other components fail and need repair or replacement. Capacitors associated with air conditioners are, generally speaking, bigger capacitors designed to assist starting motors, and then keeping them running. There are several motors present in an conditioner and heater systems and they all require capacitors to get them started initially, and then to keep them performing in rhythmic syncopation as well. A typical residential air conditioning unit employs a variety of capacitors to keep it’s component parts running efficiently and effectively. Extreme Risk Of SEVERE SHOCK!!! 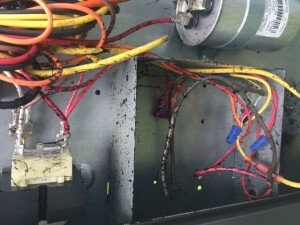 Start capacitors should be checked and serviced by trained air conditioner technicians ONLY! Do not attempt to inspect, assess, or replace these parts yourself! That’s what we are here for! 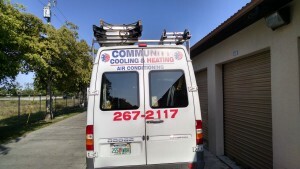 Community Cooling and Heating Inc. Proper maintenance protects your equipment, and helps keep more money in your pocket. Our well stocked trucks, and well trained air conditioning technicians are always on call when you need air conditioner services, repairs, or maintenance. 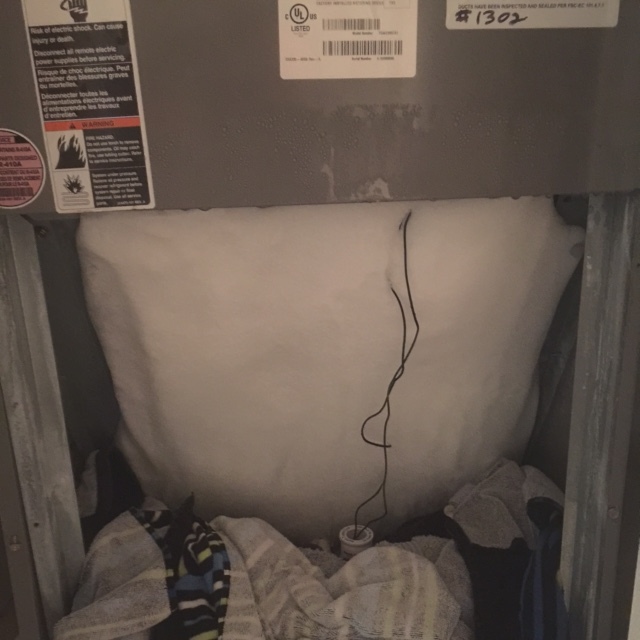 Fort Myers Air Conditioner Problems? Often, in the course of repairing and maintaining air conditioners in Fort Myers, we encounter situations and scenario’s that need to be brought to the home owners attention. Many times the air conditioner equipment we are servicing is on a roof top, or in an attic, or the home owner is unable to get to the equipment easily. In order to be able to fully explain the precise nature of the problem, and the options available to fix it, it has been our policy to photograph these components, or the problems affecting them with our digital cameras, and use those images to explain the situation. As a result we are often able to share these photo’s here and give interested parties an inside view the day to day challenges we face, and a greater understanding of the myriad of potential problems a typical a/c system may face. 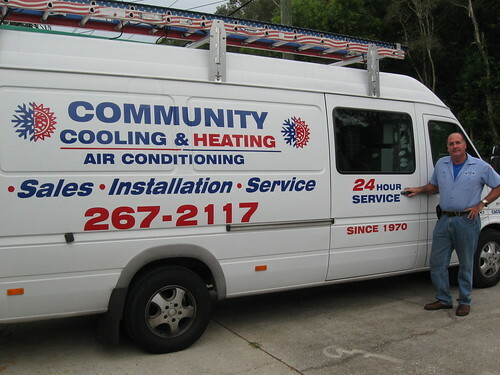 Community Cooling’s focus has always been to provide top quality service and repairs, at a reasonable price, and earn their customers trust and respect … to become a valued resource of such integrity that the customer would not consider allowing another contractor, to work on their equipment. Over the years this has proven to be a philosophy that bears much fruit, as over 90% of our clients report they are thoroughly satisfied with our services, our results, and our prices! Expert repairs combined with a genuine commitment to customer service! Big companies, with dozens of trucks on the road, have a high overhead and are forced to always push their customers in the direction of replacing their a/c equipment … that is what is most profitable for THEM! Community Cooling prides itself non inspecting your equipment, presenting you (the homeowner) with the options, and costs associated with those options, and letting you decide which option best suits your needs and budget at that time. The choice is yours. cooling your home efficiently, and cost effectively! For a thorough cleaning and inspection of your air conditioning equipment call today! Serving Ft Myers Homeowners for over 40 years!